Fifty years of marriage is quite an achievement. It deserves a grand celebration, and of course a grand cake. The eight cakes represent all eight Diola siblings. 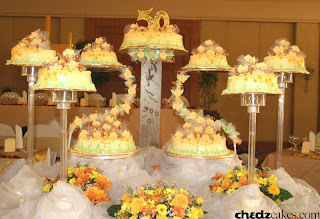 Each cake was covered in golden yellow sugar flowers. The biggest cake in the middle represents their parents. It was topped with the number 50 and sugar flowers. We used two S-stands and six glass stands for the smaller cakes. An etched glass cake stand holds the center cake.